Sets up a new, blank design of 300 warp and weft threads, 8 harnesses, and 10 treadles. Please see Section 10: “Loom Menu” for more information on changing the size of the design. You can specify some other default size and type of design to be created by New Design using the Preferences command in the Edit menu. Please see “Preferences” for details. Reads a saved design from disk, allowing you to pick up work where you left off after you did a Save (see below). You may repeat New and Open until you have a total of three designs active. Then both New and Open will gray out, indicating that you have to Close a design before using New or Open. Normal shows files created by WeaveMaker. When Normal is selected, WeaveMaker only lists design names that are in WeaveMaker format. All Files shows you the names of all files on disk, regardless of how created. Not all of these will necessarily be valid design files. Puts a copy of your design on either your hard drive or floppy disk, and allows you to name your new design. This lets you quit out of WeaveMaker, go away, and come back later and pick up where you left off (use Open to recover your design). 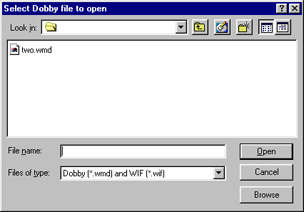 Similarly to Open, both Save (see below) and Save As allow you to specify the file format. WeaveMaker defaults to .wmd files, the standard WeaveMaker format. It is beyond the scope of this document to describe the idiosyncrasies of design formats other than that used by WeaveMaker. If you understand other formats that may be listed and need to create designs in those formats, please do so. However, you are cautioned against routinely saving WeaveMaker designs in any format other than “.wmd.” There are subtle differences among formats, and WeaveMaker cannot always warn you when you have selected a format which is not sufficiently robust to contain all the required information about your design. If you are working on a previously saved design, Save will save over that copy, destroying the way it looked when you opened it. If you want to keep both the original and the new form, use Save As and give the file a new name. Removes a design’s windows from the screen. To resume work on the design use Open. If you have made changes to the design and have not Saved those changes, Close will ask you whether it should save them. Reply yes or no. Palettes, which are WeaveMaker color databases, are the subject of a separate series of sections devoted to color. Please see “Color” in the Index for details. Use these commands when you want to take information from WeaveMaker into another program, by creating a TIFF file which can then be opened, imported, or placed in some other program. Export Fabric creates an a file representing just a fabric, without the accompanying threading, tie-up, treadling, or peg plan grids. Export 3-D creates a file which captures the image created by the “Show Fabric in 3-D” command (please see Section 14: Special Menu for details). Export Grids creates a file which resembles one of the design grids (threading, tie-up, treadling, or peg plan). Determines precisely how a grid is exported. Lets you select the way you want your design to be printed. Printing is covered in full in a separate section (please see Section 25: “Printing” for details). Shows you (on the screen) what you would get if you did a Print command. Use this to verify that you got your Print Options correct. Lets you select the paper orientation (normal or sideways), paper size, and print scaling prior to printing. Use Print Preview to verify your selections. Sends a copy of your design to the printer. Printing is covered in full in a separate section (please see Section 25: “Printing” for details). Shuts down WeaveMaker, automatically saving your work in a temporary (unnamed) file. The next time you start WeaveMaker, your designs are automatically reloaded, so you can start in working again, just as though you had not shut down WeaveMaker. Shuts down WeaveMaker. All open designs are closed. If you have unsaved changes, you will be asked whether they should be saved (reply yes or no).